I kept busy at this year’s Game Developers’ Conference. 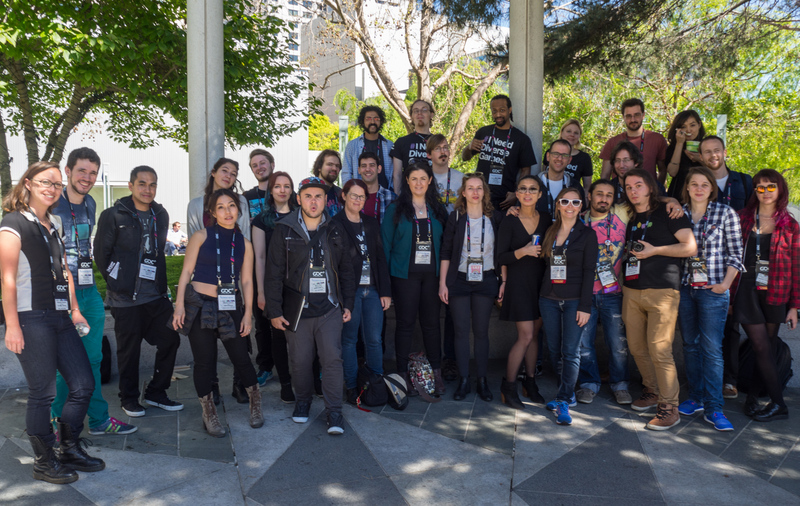 As well as speaking, networking and learning, I also initiated an international meetup for the organisers and delegates of GDC scholarship programmes – crossing some international divides and experimenting further with a friendly approach to games socials. For those who aren’t aware: the Game Developers’ Conference runs an annual scheme which helps to bring in student and professional delegates who would otherwise be unable to attend. GDC provides free conference passes, and the scholarship organisers usually work to provide further benefit to those who are brought in – such as bespoke networking and mentorship events. This year, Diversi partnered with King in order to provide one such scholarship for female-identifying students in the EU. 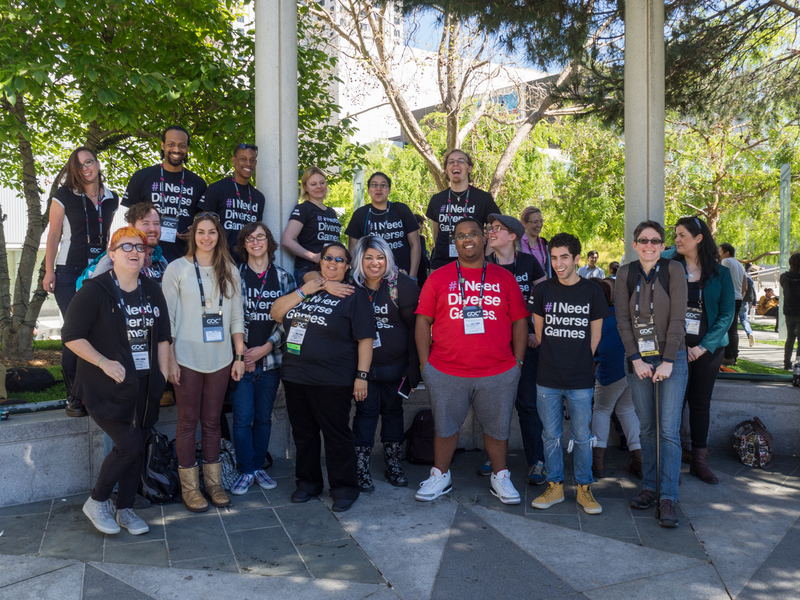 We joined around a dozen other initiatives, such as geographical groups from the likes of India and Argentina, and other minority outreach groups – like the IGDA’s women-in-games group, and #INeedDiverseGames. Soon after Diversi’s scholarship scheme came into effect, I realised (to my surprise) that although such schemes have been running for a number of years, there did not appear to be any precedent for cross-scholarship meetup events. Given the cultural, geographic and experiential reach of these schemes, it struck me as wasteful not to try bringing such a broad range of people together during the conference. So it was that I sought to apply lessons I’ve learned from running LadyCADE to an event which would effectively be co-hosted by up to a dozen people. The best trick I’ve learned from running LadyCADE events is to apply a delicate touch, and let common sense prevail. Rather than delving down into the minutiae of logistics and rigorous delegation of responsibility, I have found that one can achieve similar results in a much more satisfactory way by empowering people to step up on their own. I then make a point of filling any emerging gaps myself. It’s a philosophy which relies easily upon the fact that everybody’s who’s volunteered to help run an event is already invested in it, and so will already have ideas or experience which they can pull on. Why waste time and trample over that with attempts to provide a concrete plan from the start? So it was that I began with a series of outreach emails – first to the other scholarship organisers whom I already knew, since I also wanted to be sure that it was an interesting and valuable new idea. Thence to the published list of GDC scholarships, which as footwork goes was a surprisingly chaotic affair. Eventually though, with a little over half a dozen email responses, I could invite the various organisers to a Slack forum in order to continue a more directed conversation. As expected, the planning of this event basically boiled down to conversations amongst a few of the more experienced event organisers. This was not something I wished to discourage, as our focus lay on having a simple, solid and safe event. With a remit like that, there’s less of a need to ensure that all creative voices are heard. However, it’s worth stating that in any volunteer venture one must still ensure that no-one goes unheard, as it is important for all participants to feel they have agency. Plans bounced back and forth and arrived at a simple and cheap idea, of arranging a picnic. The details came together relatively late, as we had to contend with interweaving the conference schedules of potentially hundreds of people – a hurdle we’d anticipated well in advance. In the end though, we managed to put together a drop-in event at GDC’s quintessential outdoor venue. We sent details of the meeting spot and times to all those organisers who’d been involved in the planning process, as well as to those who might be able to forward on to the more elusive scholarship organisers, whom I’d failed to reach earlier in the process. In the end we drew in organisers and delegates from #INeedDiverseGames, International Ambassadors, the IGDA’s Women in Games SIG, Pixelles, and Diversi – plus a couple of conference associates and other interested parties. Not everyone was in attendance at the same time – we knew that the schedules of individual scholarship programmes and the conference itself would not allow for that. However, the result was still a 3-hour, rolling social event which brought together students and professionals from at least four continents. We gathered during the middle of the conference in the California sunshine, to chill out somewhere friendly and meet new people from similar-yet-different circumstances. It is my hope that the scholarships picnic will become a regular feature – especially now that the pilot work is done. Its simplicity makes this an easy event to run, and the concept of having delegates bring their own snacks and drinks makes it an affordable one, also free of the sorts of social pressures which may be instilled by meetups hosted in a bar. Finally, it also proved to be a good opportunity for myself and my Diversi colleagues to meet the heads of other scholarships, many of which are attached to diversity interest groups themselves. Although not a formal networking event by any means, it was nevertheless fun, informative and reassuring to have met some of our peers from overseas. My thanks to everyone else who was involved in the process of founding this event, and to those who came on the day! Suffice it to say: if you’re looking to run a GDC scholarship in 2017 and would like to join in planning for a follow-up picnic, do get in touch!